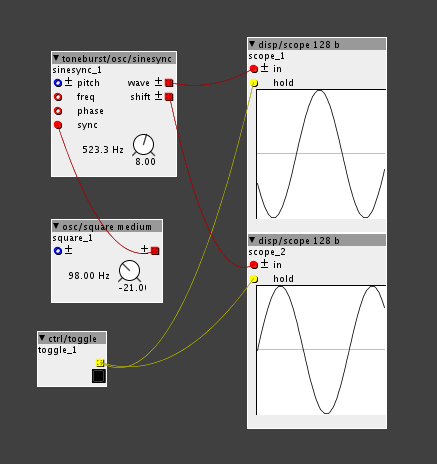 Some users often ask contributors to add modulation inlets to their objects. While a workaround exists (adding a patch/modsource object and right-clicking on the parameter to modulate), sometimes this solution is not efficient or not available at all (see for example integer boxes). What to do in one of these cases? Select the inlet tab on the left and then add as many inlets as you need. Give a name to such inlets, something you can remember. Do not use spaces or symbols, just letters or numbers. As for the type: dials (knobs) correspond to frac32 inlets (blue). 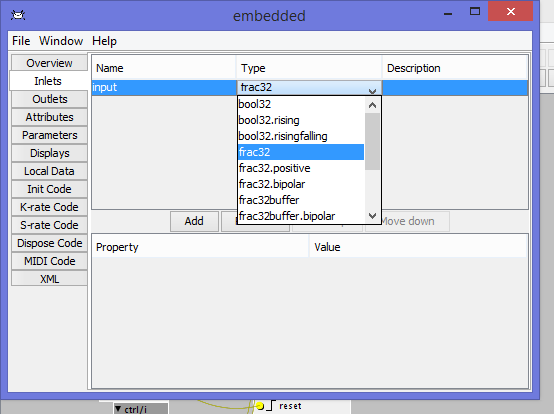 Buttons and toggles correspond to bool32 inlets. Integer boxes correspond to int32 inlets. All the other stuff is just labels on the object (you can experiment on this). Also, buffered inlets refer to the audio rate stuff. It's not the case to touch those. Now the tricky part: you have to search in the k-rate and s-rate code every reference to the parameter you want to hack. You'll find stuff like param_ParameterName. Remember to add ";" at the end of rows (the code won't start otherwise). 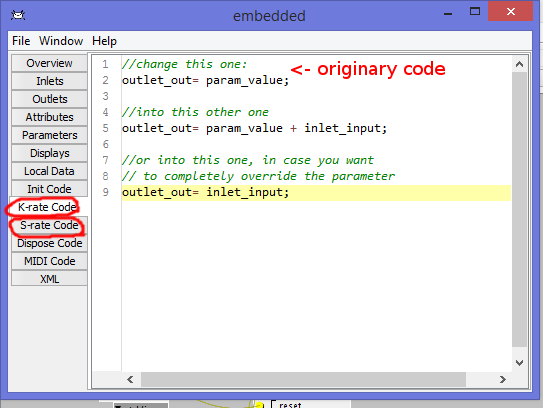 If you choose to override completely a parameter you can then go in the parameters tab and delete the parameter. For this example i hacked ctrl/dial. Something can go wrong while doing this. Aside from syntax errors, there are some cases in which a parameter is bound inside a very specific range. Outside that range weird stuff might happen (pleasantly weird but also patch-crashing weird). This might happen because of variable overflowing, for reading/writing arrays outside their range or for similar reasons. How to modulate objects that lack inlets? Assign GPIO to parameters that are NOT "AVAILABLE"? Thanks for posting this, Sputnki. I get so far, but I'm confused about how I need to edit the code. I'll give a step-by-step of what I did so that you have exactly what I have. If you were to copy what I did using the exact same object and input name that I used, you could post a screenshot of the edited k-rate code, then I would understand. In my example, I wish to use the inlet named test to drive the dial named amount. In this case, there's no code to edit under S-rate, only K-rate, but what do I change to make it work? It'd be great if you would post a screenshot of the edited K-rate code for my specific example, it'd be easier to understand because it'd be a real example to learn from. 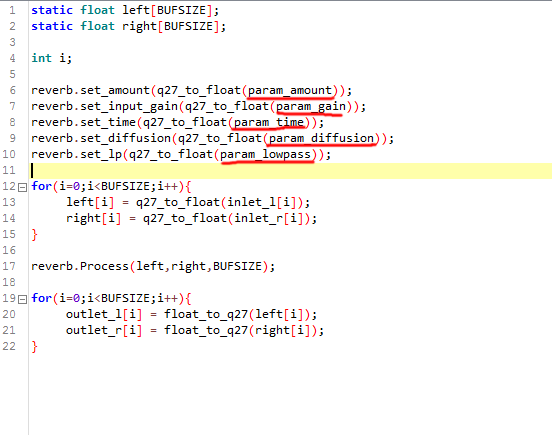 You can see in the image all references to the parameters highlighted. Correct Application of Sub-patching - all complicated patches? Any ideas? Would be great to easily add inlets this easily! Sorry mlbstrd, but I never got to the point where did a specific edit to a specific object, I was just super-pleased that I could do it at all. I know I practiced at the time and saw results, but whether it was done right and bug free is another thing entirely. The problem might not actually be your coding, it might be something to do with the patching environment so hopefully someone who knows what they're talking about will step in and advise, but I'm sorry I can't help. 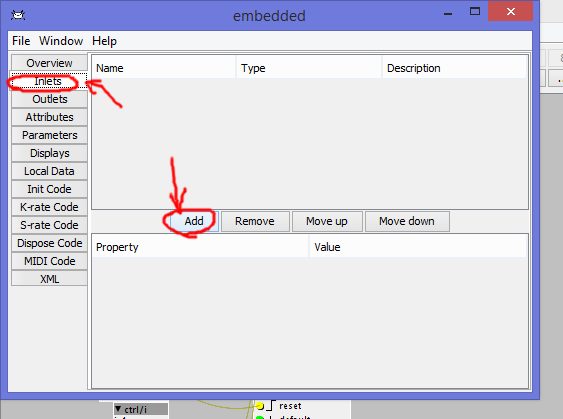 the generated error means, that an include file is missing, because you embedded the object and there is currently no way to include a file in an embedded object. so, in this case this method won't work. that being said, there are only a handful of objects with includes in axoloti world. 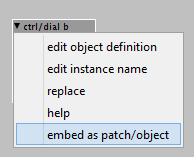 Go to "edit object definition" and "copy to library" to save the object as a real object to a folder you like. Go to the "rings" folder, in the factory library, then simply copy the header file "rings_fx.h" to the folder that you saved your own version of the object in. (It's because the object need to have a specific path so it MUST be saved(copy to library).... And then next the object expects the headerfile to be in the same folder as the object itself. So you need to copy it over manually, as described above). After using workarounds for a while, I'm trying to mashup some oscillator objects that I like to create my dream oscillator. I've had a little bit of success, but now I'm stuck. an oscillator with a fast, stable sync input so that i can use it in conjunction with video VSYNC pulses. @toneburst sinesync is the only thing i've found that syncs stably. Quadrature outputs for to use for rotating a video raster. SO, an amalgam of a few of these oscillators would do it, but none of them are up to the task on their own. Now I just need to add the other waveforms and I'm a little overwhelmed. I also tried converting the dual multiwave LFO to s-rate, but I can't get it to work. I changed the inlet/outlet types and parameter types to match what i've seen other s-rate oscillators use. I also cut and paste the code from k-rate to s-rate. Didn't work, lol. Am I even close? Is it as "easy" (as easy as modulation-inputs) to make stereo out of mono-modules? Or is to dublicate the modules the best way? I think the easiest way is to make a subpatch and throw it all in there. You can write it in code, for example making a for loop X times depending on how many you want. Or you could just copy the code inside and object and rename the variables for the second version. Like if you have some variables called "int a" and you copy that one, you neeed to rename it, cause you can only have one variable with that specific name. So basically if you know a little code you can try the above. Time yes, but S-ram I am not sure, cause you still need 2 of each. I think its going to be very little you save if its just a stereo delay. For the S-ram, try using the delay that uses SD-ram. There are a lot more SD-ram than S-ram, so you can save the S-ram for other purposes. Probably I confuse what RAM is needed for what. All the dials on an object is it in SRAM, right? I dont think you should worry too much about a couple of dials, there are other things that will take up alot more memory than dial, like for example if you use a delay that uses S-ram, instead of the SD-ram version. Anyway, I think you should just start patching and if you eventually get to the point where you hit the limit there are always ways to optimize a little bit here and there. But overall I think you should just build what you like and the realise if you actually have issues or not. Use some of the tips above, like use SD-rams for the delay anf you will go far.